Walking around the corner from the King’s Head in the Market Place, and into Pimlico …. Congregationalists assert that each local congregation of true believers is an identifiable unit held together in a covenant relationship and subject to no outside, human authority. This self-governing nature led to their original name of ‘Independent Church’. The Independent Chapel at the beginning of Pimlico was a very old one, and its services were well attended. Timeline; late 18th Century – 1904. Important (and some not so important) dates and events in the life of Ilkeston’s Independent Chapel. In the third quarter of the eighteenth century we find Francis Ball, a Trowell man, taking a regular walk to Nottingham to attend and worship at Castle Gate Congregational Church, this being the nearest such church to his home. 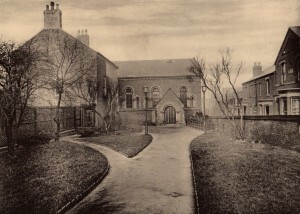 He later moved to Ilkeston while continuing to attend the Castle Gate church, but came to realise that ‘a spiritual source’, an Independent Church, was needed in Ilkeston. Others shared his sentiment — men like Thomas Barker and John Bowes, who together had been travelling from Ilkeston on Sunday morning to Breedon on the Hill, to the church there. 1770.… Meetings began to be held at John Bowes’ house in Pimlico and ministers were sent on weekday evenings from Nottingham Castle Gate, to lead the meetings. One such minister was the Rev. Robert Galland of Warwick. 1771 …”receiving encouragement from the generous friends of religion at Nottingham”, a new meeting house was established at Ilkeston. 1772.….On August 25th the Independent Church at Ilkeston was formed. Eight men and four women subscribed their names to ‘The Covenant, certain Articles of Faith and a statement of Church Discipline’. Alice Adkin or Attkin (nee Flint) at this time the wife of Moses, who died in 1773. Then, in 1776, Alice married Joshua Gregory, farmer, at St. Mary’s Church, Ilkeston. Francis Ball, stocking-weaver, who married Mary Sudbury, daughter of Thomas and Mary (nee Fox?) in 1776. (Their marriage entry in the Parish Register appears just before that of Alice and Joshua). They had several sons and the family was to play an important part in the history of the lace industry in Ilkeston. (See And Balls). John Bowes who died February 13th, 1789. Hannah Hancock (nee Lacy) who had married Henry in 1761 and died in 1825. Henry Hancock, stocking-weaver, who died in 1801 and was buried at St. Mary’s Church. Thomas Making who died April 13th, 1816. Edward Ridge who died July 16th, 1785. 1772.…. On October 14th eight more names were added to this list, including Thomas Sudbury. The last on the list was Robert Galland, the first minister of the Church, ordained Pastor on November 4th, 1772 and served until 1779. His successor was the Rev. Thomas Hall. With Edwin Trueman, R. Westland Moreland was the co-author of ‘A History of Ilkeston’ (1899). Writing in the Ilkeston Pioneer (July 1927) he mused on the ministry of the Rev. Galland and repeated an anecdote he had discovered in a pamphlet printed for the Religious Tract Society about 1831. “While Mr. Galland was Minister at Ilkeston, an ungodly man threatened his life because he supposed that his preaching had contributed to the fanaticism of his son’s wife; a crime that could not be forgiven. He vowed vengeance no less than death and sought an opportunity to execute it; but the lord, who defends His people, took care of His servant, and shielded his head in the hour of danger. Having heard that there was a prayer-meeting at his son’s house, on the Sabbath-day morning, he repaired thither with the instrument of death: being hardened to his purpose by drinking all the preceding night. His companions in wickedness, however, endeavoured to dissuade him from his design, and to wrest the knife from his hand, with which he meant to do the business. He repaired to the place, breathing threatening and slaughter: but he was disappointed of his victim, for his information respecting the meeting was unfounded. However, God met with him in wroth, for on his return he fell into a ditch and was found dead, Thus the Lord took care of His servant and plentifully rewarded the evil doer”. The historian concluded his article by posing the question ‘Between what years was Mr. Galland minister at Ilkeston ? 1781 …..The first chapel and manse were erected on land given by John Bowes. This is the year agreed by most sources, although in others there is mention of a meeting house ‘erected in 1771’. This may be reference to the house in Pimlico where the first meetings were held? 1808.…. A Sunday school was formed, under the Rev. Joshua Shaw’s ministry. This was held in a small room, capable of holding about 80 children, built on the west side of the chapel and adjoining it. Children were taught ‘to read God’s word and keep the Sabbath’. One of these was Mary Ball, born in 1807, the daughter of Francis and Mary (nee Hirst) who joined the Sunday school at the age of three. There is a suggestion that prior to 1808 a school had been operating in a building on the southern side of Pimlico, near to a passage leading onto what was later Albert Street. Joshua Shaw was the brother-in-law of chandler Moses Mason of Bath Street, having married Mary Mason in 1801. 1833 …. Thomas Harrison supplied the first Chapel organ. Joshua Shaw was followed as Minister by the Rev. James Adolphus Savage and then the Rev. Davies who left Ilkeston in December 1844. The chapel was then left without a minister for almost two years before the arrival of Charles Hargreaves in October 1846. 1842.…. A new Sunday School was built at a cost of £200. (1841 and 1844 are also quoted for this event). In December 1808 William Hawley, shoemaker of Pimlico, married Sarah Sudbury, daughter of William and Sarah (nee Thompson) and the niece of Mary, wife of the above-named Francis Ball. Shoemaker William gave evidence to the 1842 Children’s Employment Commission, inquiring into the employment and condition of children in mines and manufactories. He was then styled as ‘master’ of the Independent or Calvinist school in Ilkeston, which had ‘105 girls and 106 boys on its list’, admitted from the age of five, classes starting from nine a.m. and finishing at four p.m.
William thought that those children working in the pits for up to 14 hours were ‘much more dull and stupid than the others’. ‘He has often to complain of the colliers’ children’s bad attendance on Sunday mornings and the reply generally is, they are so tired they overslept themselves’. 1848-49.…. A new chapel was to be built in Pimlico. Matthew Hobson, grocer, farmer and miller of the Market Place. Thomas Merry, grocer and druggist of the Market Place. Robert Burgin, blacksmith of South Street. William and John Ball, sons of Francis, lace manufacturers. Samuel Straw, canal agent of Moors Bridge Lane (Derby Road). George Purcell, chemist and druggist of Bath Street. Francis Sudbury, glove maker and hosier of South Street. William Lovejoy, schoolmaster of South Street. The chapel was begun on August 1st, 1848 and finished on March 31st, 1849 at a cost of £750. It was officially opened on April 10th, 1849 and remained open until March 22nd, 1905. The 1851 Religious Census gave an estimated national membership of 165,000. The same census noted that the Pimlico chapel had 320 sittings, none of them free, “professedly so and marked out as such. Yet there are poor people amongst us who regularly occupy sittings without any charge – thus enjoying the advantage of a free sitting, without having the badge of poverty affixed to it”. (This was the note added by the Independent Minister Charles Jonas Hargreaves of Boot Lane, later known as Stanton Road). Average morning attendance of the general congregation was 130 with a Sunday school of 70, while the evening congregation was 200 with a Sunday school of 30. April 1853 …after nearly seven years as minister at the chapel, Charles Hargreaves left Ilkeston to become pastor at the Congregational Church in Cheadle, Staffordshire. His place was taken by the George Hoatson who arrived in November 1853 and resigned in February 1855. In the early 1860’s a gallery for the Sunday school children and singers was added in the chapel. The pulpit was altered for the convenience and comfort of the minister. And an organ was purchased and erected in the gallery. Newly-arrived in Ilkeston, Master of the British School in Bath Street, Wright Lissett was appointed as the first organist. And soon after, the Church resolved to sell off their double bass to help clear the ‘gallery and organ’ debt. One instrument that was not sold was the ‘old-fashioned wooden pipe or flute’, which was reputed to have been used by Joshua Shaw in his services. This instrument found its way into the possession of grocer Moses William Mason and his wife Emma Elizabeth (nee Maltby), sister of Charles Maltby, lace manufacturer of Dalby House. She later (about 1928?) left for Canada, unaccompanied by the flute. 1864.….One Sunday morning, William Sudbury, butcher of South Street, and Richard Powell Howard, engineer of Belper Street – who were also Superintendent and teacher, respectively, at the chapel Sunday school – were strolling down Nottingham Road when they caught sight of a band of dirty and ragged children. The idea for a Sunday school in that area was then formed in the mind of the Superintendent and the Kensington Mission was soon established ‘to educate the dirty and ragged children of that area’, its first session being held on August 4th, 1864. But not everyone in the Kensington area was happy to hear their children described as ‘ragged’. An indignant ‘Martha Marlow’ wrote to the Pioneer on behalf of herself and several other Kensington mothers, declaring that her children were clean, neat and not dressed in rags. Though poor, they did have their standards! Initially the schoolroom of the Mission was in a cottage loaned by Benjamin Tatham, a master needlemaker who lived in Needlemaker’s Yard (Kensington Street). Richard Powell Howard led the singing and William Sudbury addressed the children who clearly enjoyed the proceedings. After three weeks the mission was such a success that larger premises were needed. A second cottage was loaned and then the club- room at the Needlemakers’ Arms was used. By the end of the year there were about 70 scholars attending. In 1865 the Mission Station at Kensington was officially recognised as a branch of the Mother Church. A Committee of Management, with a Pastor and Treasurer (Matthew Hobson), was appointed. In early 1866 the Mission again moved into new premises … the middle room of a nearby factory, damp but merely temporary. Efforts were already afoot to raise finance for more permanent accommodation, for a Sunday school and congregational worship. 1869-1870.…. Premises for the Mission were built and dedicated, on land donated by Matthew Hobson, at a cost of £300. At the end of 1881 the Mission Room was rented by the Ilkeston School Board to provide a temporary infants’ school in the area while a more permanent school could be built. 1904.…. Work was begun on a new church in Wharncliffe Road designed by local architect Harry Tatham Sudbury. On April 9th memorial bricks were laid for the Sunday School, followed on April 27th by memorial stones for the church being laid. The opening ceremony for the church was March 22nd, 1905 when the congregation, headed by the minister, walked from the old chapel to the new church. I suppose when the Wharncliffe Road Church was built, the name Independent was changed to Congregational. We are looking at the chapel from the direction of the Market Place. Burns Street is on the right. It had resident ministers, Revs. Heron, Allsebrook and later on Rev. Bonser. Adeline’s recollections seem to be primarily of the 1860’s and 1870‘s. Of the ministers she mentions…..
Ebenezer Sloane Heron arrived in Ilkeston in January 1856 after his seven-year pastorate at Denholme near Bradford and was minister until December 1861. He then left for Bingley, Yorkshire, having raised the church membership total to 79. “He was a man fixed with an evangelical zeal and burnt up with the desire to save one soul alive whilst yet ‘twas day…. His sympathy and abounding goodness to the poor and sick won for (him) widespread respect, whilst by many he was greatly beloved”. Ebenezer had married Elizabeth Ayrton in 1852 and the couple lived at Chapel Yard, adjacent to the Independent Chapel, in Pimlico. During their time in Ilkeston Elizabeth gave birth to four children … John William (1856), Jessie Carrie (1857), David Ayrton (1859) and Elizabeth Ann (1861). Ebenezer and Elizabeth spent their final days in Knox County, Tennessee, and the former minister died there in December 1887. I remember the Rev. R. Allsebrook. (He) was the first to live in the new house in Market Street, now the Anchor Inn. Robert Allsebrook, a student of Spring Hill College, Birmingham, began as pastor in August 1862 and was, strangely enough, publicly ordained to the ministry in Ilkeston only on March 3rd 1863 when “the congregation filled the chapel both in the afternoon and evening. The day was remarkably fine, and allowed friends to congregate from places many miles distant from”. Robert struggled with illness throughout most of that year and died of consumption on December 27th, 1863, aged 27, at the home of his parents at Chadwick Manor House near Bromsgrove, Worcestershire. “In Sunday school … he had an astonishing command. He was greatly beloved by the scholars, despite the fact that he was a born disciplinarian. Commotion, ‘tis said, died down so soon as he entered the room”.A marble tablet to his memory was placed inside the Independent Chapel, by Mary Ball, (it is said), his betrothed. I remember the … Rev. W.W. Jubb. There was a gap of several months until the arrival of Rev. William Walker Jubb at the chapel in May 1864. He served until January 1867 and during that time took a prominent part in the establishment of the Ilkeston Working Men’s Club and the Kensington Mission Church. He moved on to Oldbury in the district of Birmingham. From 1891 he was Pastor of the Central Congregational Church in Fall River, Massachusetts, of which an active member was Lizzie Andrew Borden, arrested and tried in 1892 for the murders of her father and step-mother. Throughout her ordeal he was ‘a strong and vocal champion of Lizzie and a firm believer in her innocence’, constantly at her side, and continued to support her after her acquittal in 1893. He died at Illesley near London in 1904. In the ‘Ilkeston Advertiser’ of Aug. 13th I saw the Rev. Alfred Bonser had passed away. It brought to my memory pleasing thoughts of his father, the Rev. John Bonser. When the Rev. John Bonser retired from the ministry he went to live in Addison Villas, Addison Street, Nottingham. When my family went to live at Nottingham, we were close neighbours, and I understand that their only child, the late Alfred, was born at Addison Villas, and when he had passed his studentship at Paton College, Nottingham, he proposed going for a missionary, and I believe did so. John Bonser B.A. was at the Ilkeston Independent Chapel from May 1867 to 1872. Shortly before his arrival at Ilkeston in 1866, he had married Elizabeth Septima Paddon, daughter of borough magistrate and timber merchant John and Mary Ann of Truro, Cornwall. She served as a teacher at the Sunday school for only a short period. She died at Chapel House in South Street on March 26th 1869 and three days later their recently-born daughter Emily was baptised at the church. In February 1872 John married again, to Isabella James of Nottingham, and two months later the family left for Rawmarsh near Rotherham. On his departure his Ilkeston friends presented John with an engraved English lever gold watch and gold pencil case, ‘as an expression of kindly feeling and regard’ and in the hope that ‘you may live many years to wear them, and by their constant use be often reminded of those who so willingly and cheerfully contributed to their cost, and thus be greatly stimulated and encouraged in your ‘work of faith and labour of love’. One of John’s last acts as Independent Chapel minister was to officiate at the marriage of Elizabeth Ann Ball and Dr. Robert Wood, whom we shall meet shortly. The son Alfred was born in Rawmarsh in 1872 though the family did later live at 12 Addison Street in Nottingham — after John’s retirement in the late 1880’s and until his death – and after. In February 1873 the Rev. David ‘Daddy’ Waters of Hockcliffe, Bedfordshire was appointed as pastor at the church. He was the zealous orator wherever he went – in the street, in the town’s shops, in local pubs — and on Saturday evenings could be found preaching outdoors in the Market Place where he beseeched the unconverted to avoid Hell by ‘reconciling’ themselves to God. But despite his zeal, or perhaps because of it, David seems to have offended some of the Church leaders, one of them being the forceful lay preacher Wright Lissett. David left for Sheffield in July 1875 and “the church entered upon the troubled waters of a long interregnum in the pastorate”…. …. until in January 1878 the Rev. John Fleming, late of Spring Hill College in Birmingham, became pastor at an annual salary of £130 plus the free use or letting of the house adjoining the church. And next? Guess what ? Another Inn. The Sir John Warren.